Late Monday afternoon, Rep. Ilhan Omar (D-MN) put out a tweet concerning the horrifying fire that engulfed Notre Dame Cathedral in Paris earlier in the day — a devastation to Catholics across the globe. "Art and architecture have a unique ability to help us connect across our differences and bring people together in important ways," posted Rep. Omar. "Thinking of the people of Paris and praying for every first responder trying to save this wonder." The embattled Democrat's response was quickly met with criticism from voices on the right over its vague nature. Conservative commentator and National Rifle Association spokeswoman Dana Loesch responded, "Well, the 'architecture' that the art was housed in is a cathedral. While Biblically Christ is wherever His people are, Notre Dame is a significant and storied icon of faith." Well, the “architecture” that the art was housed in is a cathedral. While Biblically Christ is wherever His people are, Notre Dame is a significant and storied icon of faith. Radio host Larry O'Connor similarly took issue with the vague nature of Omar's tweet, simply posting: "Art and architecture." "Art & architecture?" former congressman and radio host Joe Walsh asked. "It was a house of worship. A Catholic Cathedral. It wouldn't have been difficult for you to acknowledge that." It wouldn't have been difficult for you to acknowledge that. Alejandrina Gonzalez Reyes reminded Omar, "it’s called Notre Dame Cathedral fyi." In a reference to Omar's much-maligned comments on 9/11, Daily Wire contributor Harry Khachatrian tweeted, "Did something happen to some building?" Making the same point, a Poland Daily writer posted: "9/11 ~ 'Some people did something' Now ~ 'Art and architecture' caught fire." 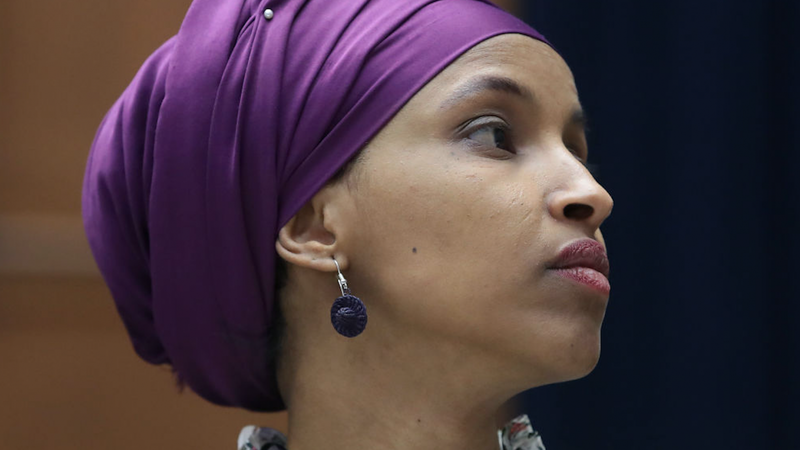 Omar found herself under fire last week over a remark she made about the 9/11 terrorist attacks that took the lives of thousands of Americans. While speaking at an event for Council on American-Islamic Relations (CAIR) in March, the Democrat referred to the atrocity as an instance where "some people did something." "Here’s the truth," Omar said at the event, according to Marketwatch. "For far too long we have lived with the discomfort of being a second-class citizen and, frankly, I’m tired of it, and every single Muslim in this country should be tired of it. [The Council on American-Islamic Relations] was founded after 9/11 because they recognized that some people did something and that all of us were starting to lose access to our civil liberties." As reported , the 13th century Notre Dame Cathedral “began burning around 12pm EST, and the structure, which has an almost entirely wooden roof, was quickly consumed in the flames." The cathedral's iconic spire and roof collapsed. By 3 p.m., the church's towers were also taken by the flames. Thankfully, "the Crown of Thorns, the Tunic of Saint Louis and several other major works" were recovered, Paris Mayor Anne Hidalgo said on Twitter. "Thanks to the @PompiersParis, the police and the municipal agents the Crown of Thorns, the Tunic of Saint Louis and several other major works are now in a safe place," Hidalgo wrote.